Summer arrives on Long Island with an attitude – never predictable, yet never indifferent. 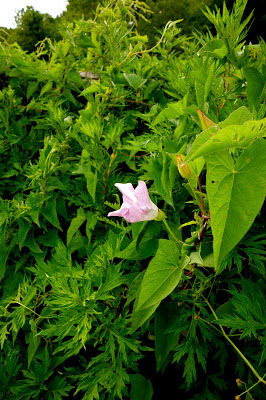 There are cool breezy days, black clouds, torrential rain, and afternoons of withering humidity. One can only accept the cacophony and try and go about the rituals of the season. I make my annual pilgrimage to Patty’s Berries and Bunches on the East End of Long Island to stock up on strawberries. The strawberry season is short and sweet, and two quarts are collected to supplement my summer desserts. At Restoration Farm, the lettuce for which we have patiently waited now stands tall. As the Summer Solstice approaches, the heat of longer days will coax the prized greens and vegetables to maturity. 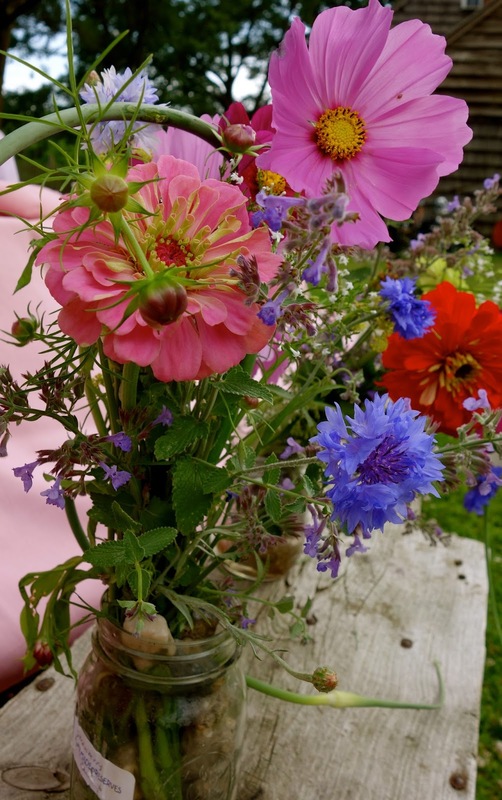 On a late Sunday afternoon, members gather for the annual Summer Solstice potluck, where we celebrate the bounty of the fields and the farm community we share. The buffet table is topped with a delicious spread of homemade salads, cakes and pies, all contributed by members. We pile our plates high and revel in the moment, enjoying the music of a sultry jazz ensemble. 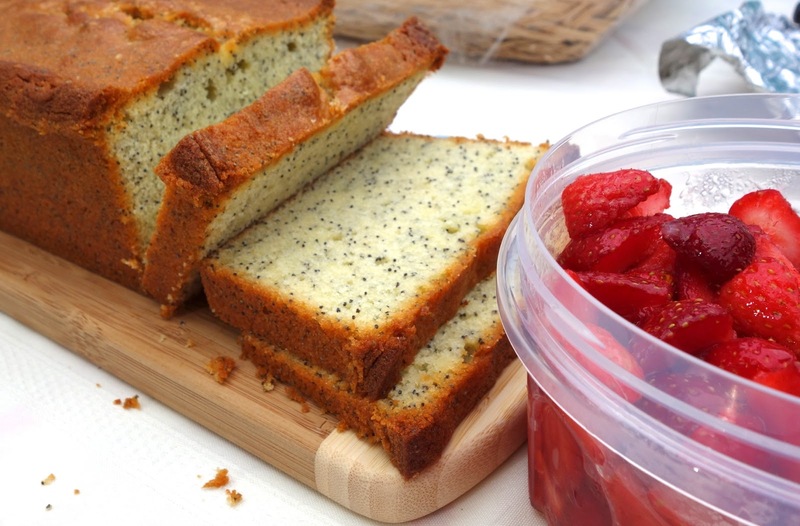 My contribution is a sweet summer treat – an Almond Poppy Seed Loaf Cake topped with Long Island Strawberries. (Recipe found here) The tartness of the strawberries perfectly compliments the delicate flavor of almonds. 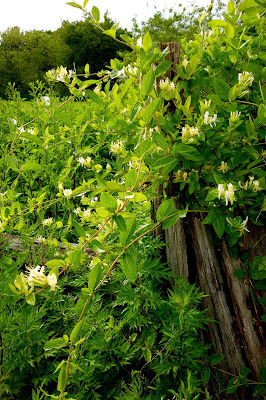 And, throughout the farm, a bevy of blossoms have emerged to welcome this precious season of sunlight, warmth and earthly delights. Don’t you just love the white gloves and the high fashion Betty Draper look of the woman on the cover? I can almost see the White Rain Hairspray dressing her auburn tresses. The pamphlet raises a myriad of questions. Who is that lovely woman, and her clean cut male companion? How many more exhibits will they be able to view once they’ve finished that Manhattan and Old Fashioned? Why just 46 great drinks? Why not 50? Here’s a look at our favorite couple relaxing at home, about to make one of their favorite drinks from the World’s Fair. He looks a bit like Perry Cuomo in this shot. 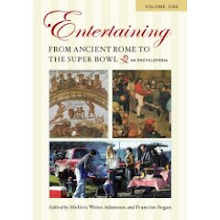 “They” don’t really hold “World’s Fairs” anymore. The future is here, and the world is much smaller than it used to be. Still, I remember the sense of awe I felt as a child when I first glimpsed the symbol of the World’s Fair, The Unisphere. It still stands in Flushing, Queens. 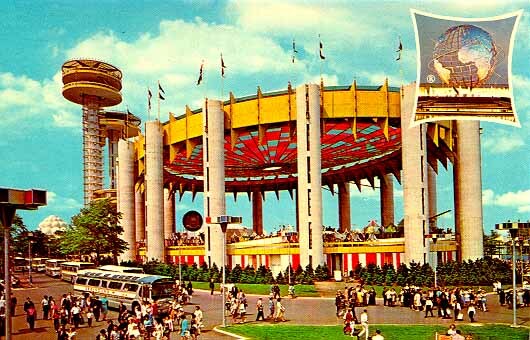 The Fair was full of futuristic exhibitions and historic first, and the architecture alone – including the multi-tiered New York State Pavilion – was considered a gleaming symbol of the dawning space age. 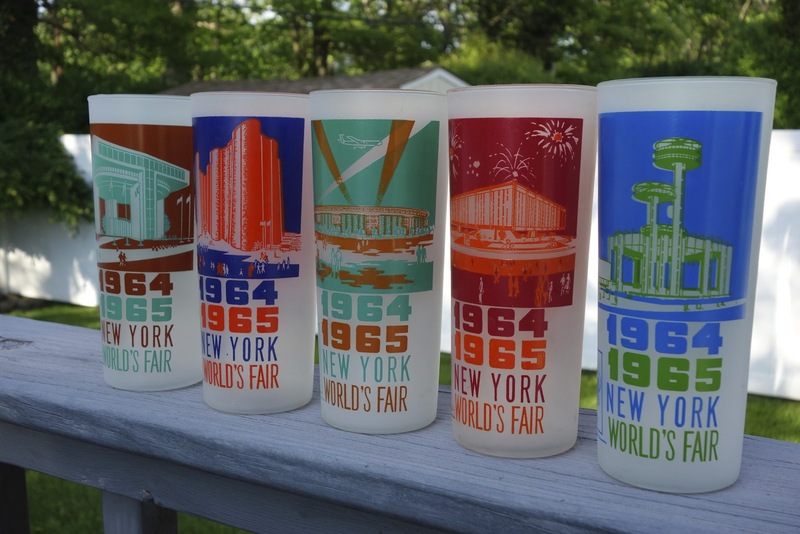 We brought home all kinds of cool items from the World’s Fair, including a set of these smoked glass tumblers featuring various exhibits from the World’s Fair. The original tumblers went to my eldest brother, but I managed to recreate a set for myself by rummaging through a couple of antique stores. The pamphlet is actually a promotional item for Southern Comfort, designed to highlight “Southern Comfort’s completely unique taste and flavor.” Southern Comfort is a whisky spirit flavored with a proprietary blend of “rare and delicious ingredients” that remain a secret to this day. 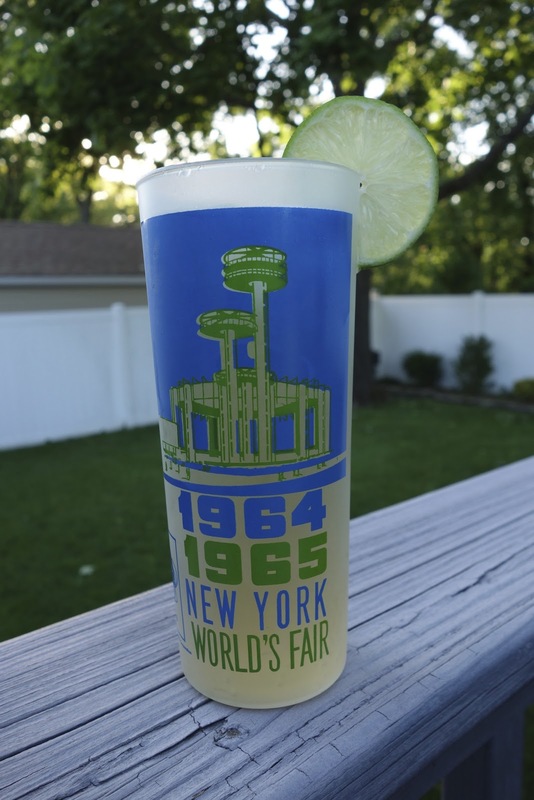 Many of the recipes in the World’s Fair pamphlet – including the “Comfort ‘N Tonic,” swap out traditional spirits and replace them with Southern Comfort. 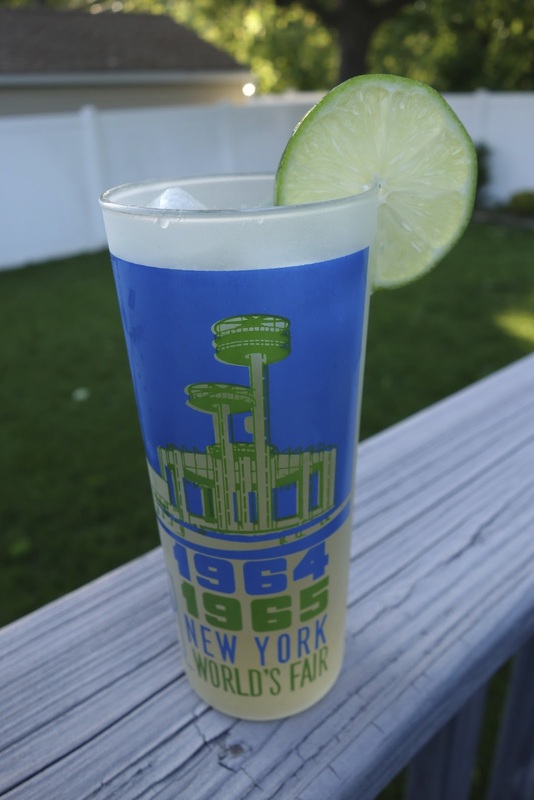 Squeeze lime over ice cubes in 8-oz. glass. Add liquor, lime rind; fill with tonic, stir. I mix my Comfort ‘N Tonic in the tumbler honoring the New York State Exhibit. The Southern Comfort adds a touch of spice and citrus and smooths out the tonic water. It’s quite refreshing. The cocktail transports me back to an era when absolutely anything was possible. Cheers to the comfort of the good old days! 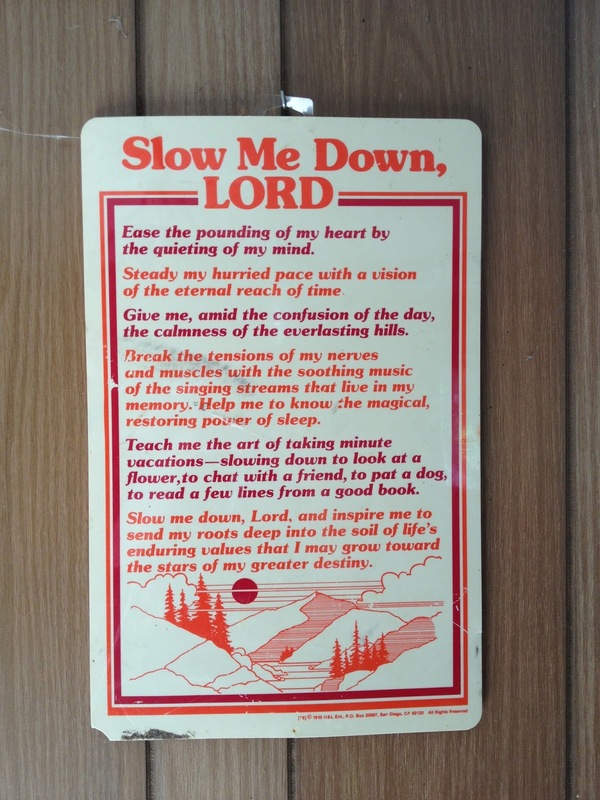 The rhythms of farming can be a bit temperamental. Weather, water, soil and weeds – it all influences the eventual harvest. We’ve had a little “farming frustration” here on Long Island. The 2013 growing season at Restoration Farm got off to a slow start. 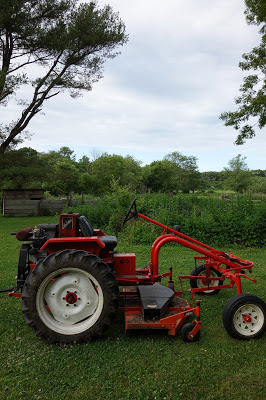 Mentally, I’d been preparing myself for the first distribution of vegetables in early June, but cooler temperatures, rain, and a perennially wet spring field slowed everything down. Our head growers, Caroline and Dan made the decision to postpone the first distribution, giving everything just a little more time to grow. Don’t we all wish we had just a little more time to grow? Normally, at this point, we’d all be up to our ears in lettuce, but instead it has been a season of waiting. Patience is the farmer’s virtue. Finally, I can take it no more, so I head out into the fields for hints of encouragement. A precious bit of asparagus has been harvested. The asparagus field and yield are small and not enough for the full membership, so the luscious stalks are extra special. The farm team is busy, working diligently to whack those weeds into submission. The lettuce is now looking bright and perky. 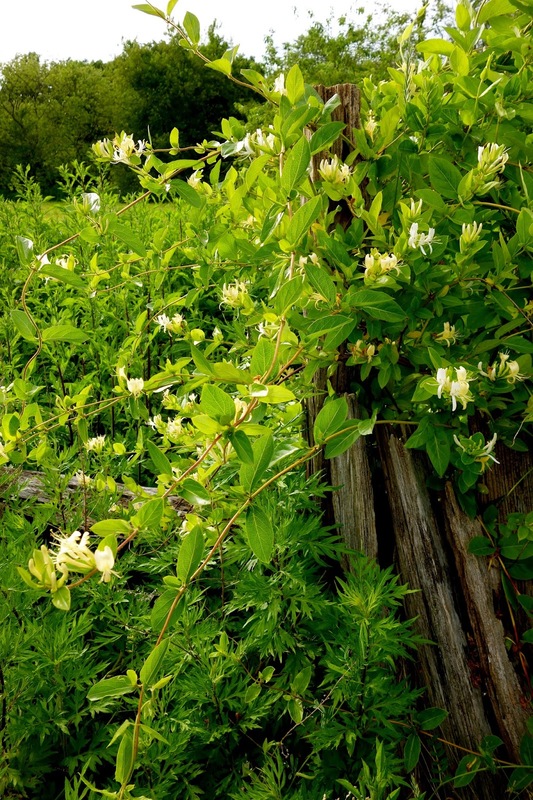 The spring peas are covered with blossoms, and there is just a hint of tender pea pods peeking out. And in the greenhouse, those hot weather peppers are getting ready for their moment in the sun. I'm passing through the trailer at the distribution area, and I notice this slightly banged up sign hooked onto the wall. 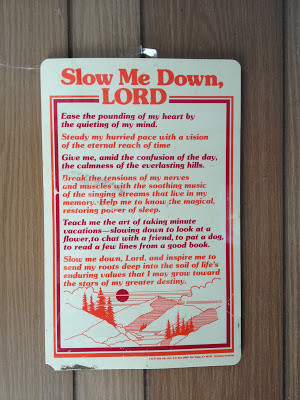 I don't know who hung it, or when, but its message seems to get to the heart of what's actually growing at Restoration Farm. The harvest will come and there will be salad days ahead. A carpet of green, accented by brilliant jewels of red, signals the start of a festive season. It’s not the yuletide, but the start of summer. 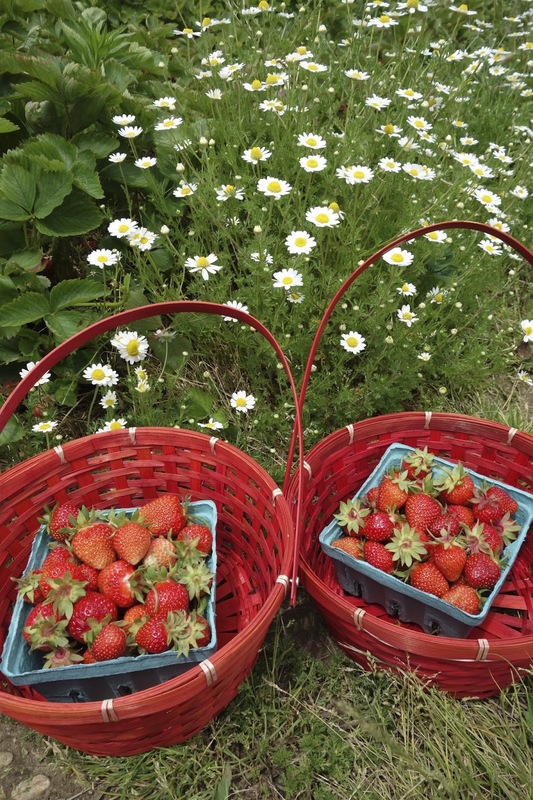 The strawberries fields of Restoration Farm offer the bright young things of summer. Red to the core, they are like sweet pockets of juice that glitter under the late spring sky. 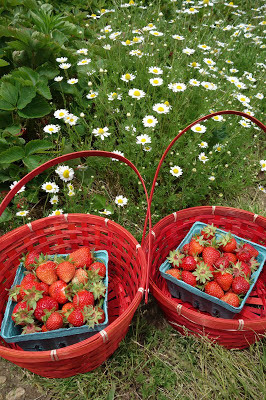 I can’t fully embrace the summer until I’ve waded into the field and picked my first basket of fresh strawberries. These blushing berries belong to us, the first fruits of the season. As always I celebrate their arrival by sneaking a taste of few berries right in the field. It’s a little miracle to savor the dripping, delicious sweetness of a fresh strawberry, drenched by the sun and plucked right from the field. The first strawberries of summer make for a particularly whimsical dinner salad of berries and slivered almonds tossed with local Long Island lettuce and asparagus. A taste of a single berry in the field at Restoration Farm is a miracle. A bowlful is a guilty pleasure! They are like no other berries on Earth!